Find doctors with the specialty of oncology with just a few clicks! 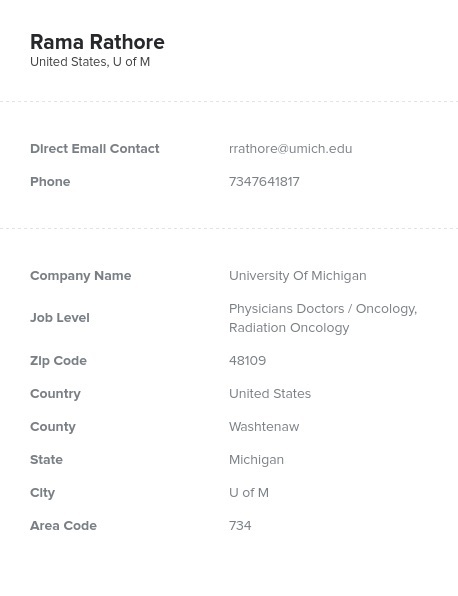 This accurate, human-verified lead list is full of the contact information of oncologists, including emails, phone numbers, addresses, and more. It’s ready for you to download right now. Oncologists study and treat tumors in the body. This group is often the most involved with treating cancer patients, as they work to screen, identify, and remove tumors. They can do this via surgeries or radiation therapy (hence the need for an even more specialized group, radiation oncologists). They need a great deal of medical equipment, technique, and real-world knowledge to accurately find and diagnose these tumors in a wide variety of patients. Often working with complex, expensive, and frequently used equipment, oncologist need to find, identify, and treat tumors. Because almost 40% of people are likely to have cancer in their lifetime, it's a disease that affects so many of us, and thus the study, technology, and methods within the world of oncology must continue to improve. If you have a piece of medical equipment, pharmaceutical regimen, or other relevant product that can help oncologists treat cancer patients, let them know using this list. With this accurate database from Bookyourdata.com, you can find a collection of oncologists in one resource. Within minutes, you can download this product, integrate it into your CRM, and start networking with these tumor and cancer specialists. Get in touch with oncologists and radiation oncologists today!